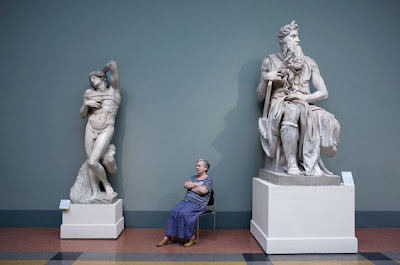 I was looking on Beautiful Decay this morning and discovered photographer Andy Freeberg and his his series “Guardians” in which we get a look at the female guards who watch over the art museums of Russia. 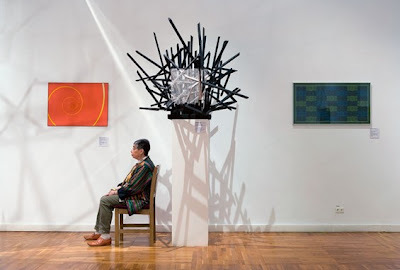 Freeberg says, “When you look at the paintings and sculptures, the presence of the women becomes an inherent part of viewing the artwork itself. I found the guards as intriguing to observe as the pieces they watch over.” Indeed, the contrast between these women and the work they’re sitting next to can be quite captivating. I love the fact that these women are dressed in their own everyday work clothes, not the stand by uniform that we Americans have to deal with.